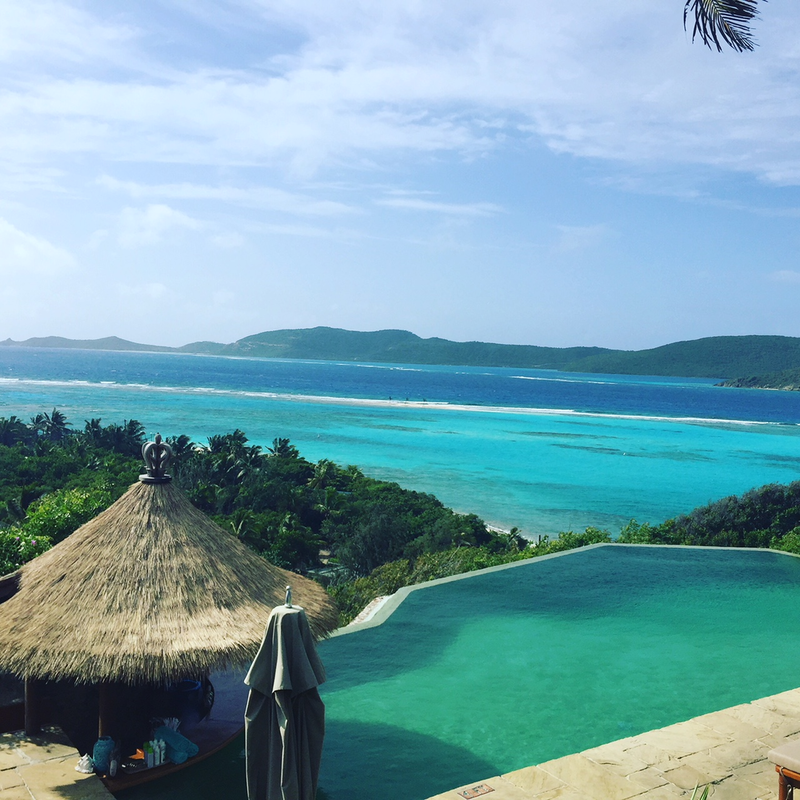 From a recent trip to Necker Island. As CEO of Ella Baché, you’re travelling often. What’s your long haul beauty regime? My skin and beauty regime comes down to routine, with hydration a must. As soon as I board the flight, I cleanse with Ella Baché Crème Douce Demaqulliant, hydrate my skin with a combination of Hydra Cellular Serum and Hydra Velvet Cream never forgetting an eye cream. Arriving at the destination, I generally have limited time to freshen up and get on with my day or night, so I jump in the shower and pop on the Intensive Extreme Regeneration Mask which is a Bio Cellulose mask enriched with Collagen, perfect whilst you have ten minutes to un-pack and get ready to go again. Ella Baché is your family business. Is there beauty advice you received from previous generations that has stuck with you? Growing up in the family business I was immersed in my grandmother’s obsession for healthy skin and all the knowledge she had from years of research on the skin’s biology and functionality, but the most simple piece of advice remains is the importance of protecting your skin from the harsh Australian sun, especially as I live 5 minutes walk from the beach. It’s the one routine I try daily to drum into my young kids now too. She taught me that your daily defense against premature ageing is SPF but not just any sunscreen, hence why we created our Ella Baché Great Suncare range it combined skincare with sun care providing your skin ultimate protection whilst nourishing it with the purest of ingredient that are also good for your skin’s health. May sees the release of your new Botanical Oil - what makes this so innovative in the Ella Baché range? Our new Botanical Oil is 100% natural; enriched with Hemp and Kakadu Plum Seed Oils, an anti-pollution solution that has been formulated and made in Australia. I’m very excited about this product as I discovered how powerful hemp oil can be on your skin, especially treating inflammation, redness or dryness when I was in a USA a few years ago. I know there is a perception that it is a hippy product, but with the research we have done into its results and benefits, I am really excited to see the results. We also use it in our facial treatments as it’s the purest and most natural oil on the market. The Key ingredients that are rich in fatty acids and antioxidants the oil works beyond the skins surface to prevent cell damage and slow down the ageing process. From a recent trip to Whistler, Canada. When you’re not travelling for work, where do you like to vacation? I’ve always been an energetic person, and not great at just sitting by a pool on vacation. My family has always been keen skiers and now with two young boys it’s something I would love to pass onto them, so we recently went Whistler, Canada the snow there is pure magic! I also travelled to New York recently and spent time wondering the streets, soaking in the culture, fashion, but also was inspired by visiting leading edge retail concepts and new ways brands are interacting with the customer. What’s your all time favorite hotel and why? I recently stayed at the Mercer in New York which was great. The location is perfect, there is a great bar and restaurant there and the rooms a good size for New York with little Juliet Balcony’s, so you can get fresh air. My pet hate is not being able to open the window and sleeping in air conditioning, so this was an amazing bonus. Bedsides your Ella Baché beauty essentials, what do you always pack when travelling? Apart from my Ella Bache essentials, it’s really important I stay plugged into what’s happening at work, so obviously my phone and small lap top is key. I am also now a big fan of Podcasts and Audio books. I love learning new things, but just don’t have the time to plow through paper based books, so this is just perfect and absolutely loving it! We’ve been testing out some of the Ella Baché products in the office and we love how there is such a huge range for all different skin types. If you could choose just one product, what would be your MUST have? Over the last few years we have been creating a Skin Solution, new retail range and treatments to target everything from Brightening, even skin tone, Luminosity and Pigmentation; Ella Baché NeoBright. I am currently immersed in the products, trialing them at home, but also the Treatment plan and options using skin care products combined with either LED or IPL for more intense pigmentation. The results so far on my skin have been amazing. Keep your eyes out for the launch date; it will be your new go to! You can see Ella Baché's full collection at their website.